Read this blog to know about Reliance Top 200 Fund and its performance. Reliance Mutual Fund, an integral part of Reliance Group, is India’s one of the eminent leading mutual funds with an average AUM (Assets Under Management) of Rs.2,43593.92cr for the third quarter of the year 2017. The most conventional scheme that is propitiously introduced by this AMC in August 2007 is Reliance Top 200 Fund - Retail Plan. In spite of being one from the large-cap space, its performance was drastically affected by the market’s bear and bull phases in the past years, hence making it an aggressive fund. Highly proficient and qualified fund managers Mr. Sailesh Rajbhan and Mr. Ashwani Kumar have been admonishing the scheme since 2007. They make sure to hit the bull’s eye by concentrating on companies which are the leaders of the sectors they operate in. And, while picking the mid and small sized businesses, they prefer only those cream companies that bear high potential operational or business edge. Being an open-ended equity scheme, it tends to invest in equity and equity related instruments of those companies whose market capitalization falls within the range of highest and lowest market capitalization of S&P BSE 200 index. The fund endeavors to invest in large-cap stocks of growth companies at a reasonable valuation that can bring stability and liquidity to the portfolio. Companies with high ROE or potentially high ROE are given more weightage in the portfolio. Although the fund is large-cap focused, fund managers have given a politic exposure to those mid-cap companies that procure the qualities of large-cap companies. Reliance Top 200 Fund aims at hatching alpha through efficacious sector call and ace stock selection strategy. Total volume of assets accrued by the fund as on February 28, 2018, amounts to Rs.8,471 crore. Obligatory minimum amount to start investment is Rs.500, and one can start an SIP even with a minuscule amount of Rs.100. Investors can easily withdraw or redeem their investment even before the completion of one year by paying an exit load of 1% of NAV as the charge. As the fund is an equity-oriented fund, hence 98% of investment goes to equity, and only 2% of amount is invested in debt and money market instruments. Being a diligent stock picker, Mr. Sailesh Rajbhan has filled the basket with a mix of 45-50 stocks, of which top 10 stocks account for 40.45% of the portfolio. Consequently, 80% of the portfolio constitutes of top 100 companies, and 90% of portfolio invests in companies with market capitalization of more than Rs.10,000 crore. Undertaking an unconstrained approach, Mr. Rajbhan and Mr. Ashwani Kumar, desire on making bigger sector deviations than before. The fund’s portfolio aggregates of giant, large, mid, and small-cap companies whose percentage breakup is well spotted in the table below. This percentage breakup of asset allocation is compared with that of S&P BSE 200 taken as its benchmark. In the past few months, the fund managers have found it more profitable to invest in the banking sector which includes banks such as State Bank of India, HDFC Bank Ltd., ICICI Bank Ltd., etc. as it had given a boom to the returns of the fund. Being a consistent performer in the large-cap space, the fund has shown exponential growth curve for long-term investments. It is proved by an in-depth analysis that if you had invested Rs.1 lac at the time of inception, then the worth till June 30, 2017, would have been Rs.2.94 lac. On the other hand, the fund’s benchmark could only gift an amount of Rs.2.22 lac to the investors for the same time period. The fund managers’ exceptional professional knowledge and ability to pick quality stocks, and comprehend the long-term trend has benefitted the fund’s performance generously. Annualized performance of the fund can help one to analyze and decide, whether one should stick with the fund or not. Although the fund could not perform well in the year 2013, 2015, and 2016, it has catered outstanding returns in 2012, 2014, and 2017. 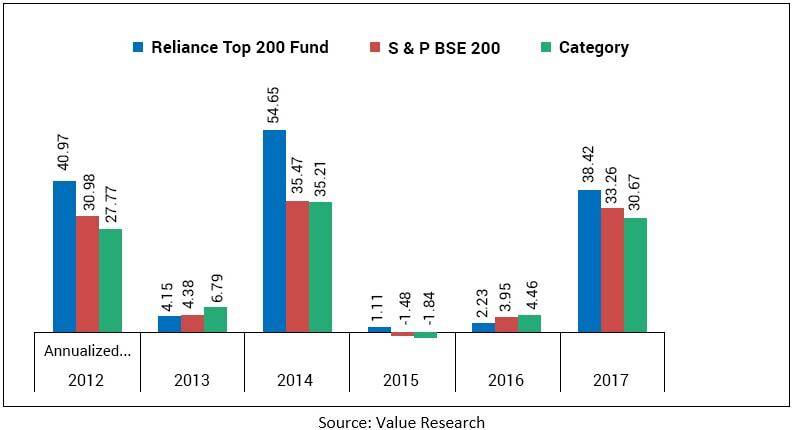 If we take a look back at its performance in the year 2010, the fund has conspicuously outperformed not only its benchmark but the whole large-cap space. It has stroked hard while the iron was hot, i.e., taking full advantage of the bull market, the fund has efficiently amassed benchmark beating returns in 2012, 2014, and 2017. Bearing risk more than that of its peers, it has managed to hoard above average returns than its category because of its high Sharpe Ratio. Sharpe Ratio determines the risk-to-reward ratio, providing the measure of risk-adjusted return of a financial portfolio. Also, the portfolio has Beta of 1.01 which shows that the fund will rise and fall more than the market, and simultaneously insuring the gain in the portfolio is amassed on account of stock selection strategy rather than timing the market. The values of these measures required for calculating risk are shown below for comparison with benchmark and large-cap space (category). The fund has performed better the last year bequeathing outstanding returns which were even more than its own benchmark and peers. Securing a 4 STAR rating from Value Research and a Silver position at Morningstar, the fund has become an exemplary among its peers by being a tough competitor. What Analysts Have to Say? Although the fund has sailed in the category of risky funds by showing too much of volatile behavior in the past years, it can help you accrue lofty returns if you can stay invested patiently for a long time.. The fund managers now believe in taking a step outside the box by giving a cunning exposure to mid-cap companies in the fund. There skilled management and use of bottom-up approach for picking up sound stocks have lead to the fund in becoming an epitome in the mutual fund market. With the experience of these fund managers and rising Indian economy, the fund seems to be well on track of its own growth trajectory. Since, the fund has shown commendable performance in the last year, the fund has become a jewel in the crown. After scrutinizing the fund review if you feel positive about the fund and want to start the investment right ahead, connect with MySIPonline and we will help you achieve your goals by providing you with support throughout the investment process. Any doubt or queries regarding mutual funds or your investments are highly entertained and welcomed here.